I try to make every holiday memorable with a special meal, a few decorations, but I always use what I have in my pantry or stored away. I've never used these Jonathon Adler pillow covers, but my black, white and green theme seemed perfect for the occasion. We bought them years ago at a JA warehouse sale in SoHo that we just stumbled upon. They were $5 for a pair...oh why didn't I buy several? The ribbon is from my stash of about six spools I ordered years ago....I never seem to run out. I love how it looks tied around white pressed napkins. They look like a shirt and tie. The boxwood is cuttings from our yard. It lasts forever even when I forget to add water. The only items I purchased besides the daffodils at Trader Joe's were the little green glasses from Ikea, $.149 each and the candle. 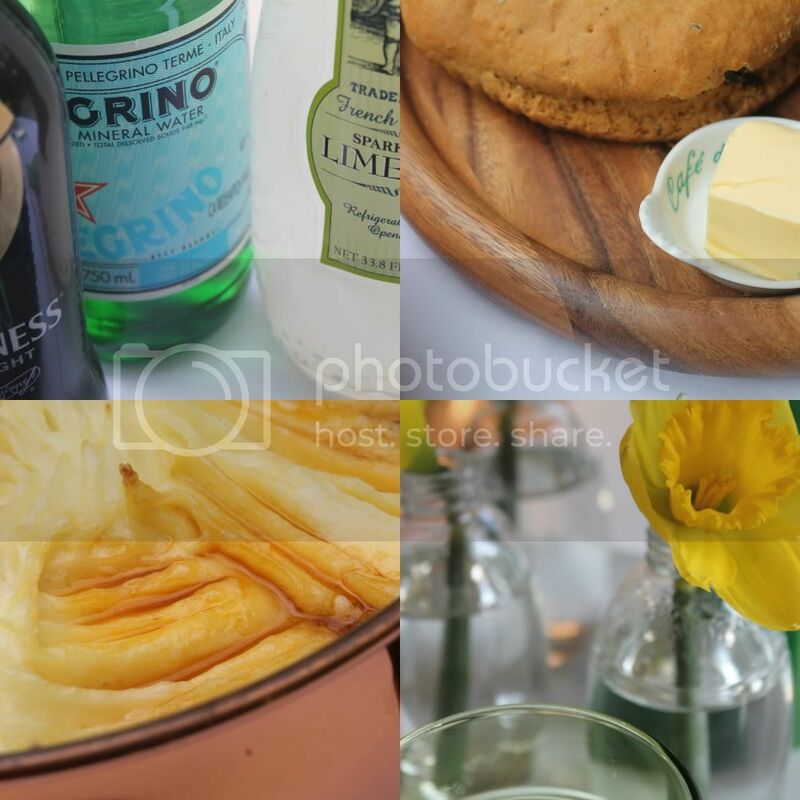 I'm serving Shepherd's Pie and soda bread with Irish Butter. I'm not sure what makes butter Irish? And for dessert...creme brulee. Absolutely nothing about creme brulee is Irish, except the flags I made, but my husband has been in NY all week and he likes it! Love that ribbon! It looks so fresh and crisp against the white napkins. Those pillows are amazing! Even with everything packed away, you manage to pull together a pretty fabulous looking spread Annie! Happy St. Patrick's Day! Love your ribbon, Annie and how beautifully simple and elegant your table and decor always is. You truly have the knack. Annie, Seriously love those pillows! The mix of the boxwood, pretty pots, ribbon all make it so sweet. Love that you do this! What a lucky family. Your guests are going to love dining at your home. Such a fun themed party! That's it.. you need your own tv show! I adore all you have done here to create the perfect holiday table. You have mad skills, Annie! Wishing you and your family a very Happy St. Patrick's Day! I don't know why but Irish butter is DELICIOUS, isn't it? Cute IKEA glasses...from your last trip? I should have been with you. Can you have coffee on Thursday? PS....I have a Jonathan Adler pillow on my post also. That creme brulee is killing me! Love your green collection! You have the best sense of frugal chic of anyone I know. I obsess over woven ribbons, you know they just don't make them anymore, all the old companies have been bought out or gone defunct. Good thing you have a stash! Such beautiful images....your photography is amazing! 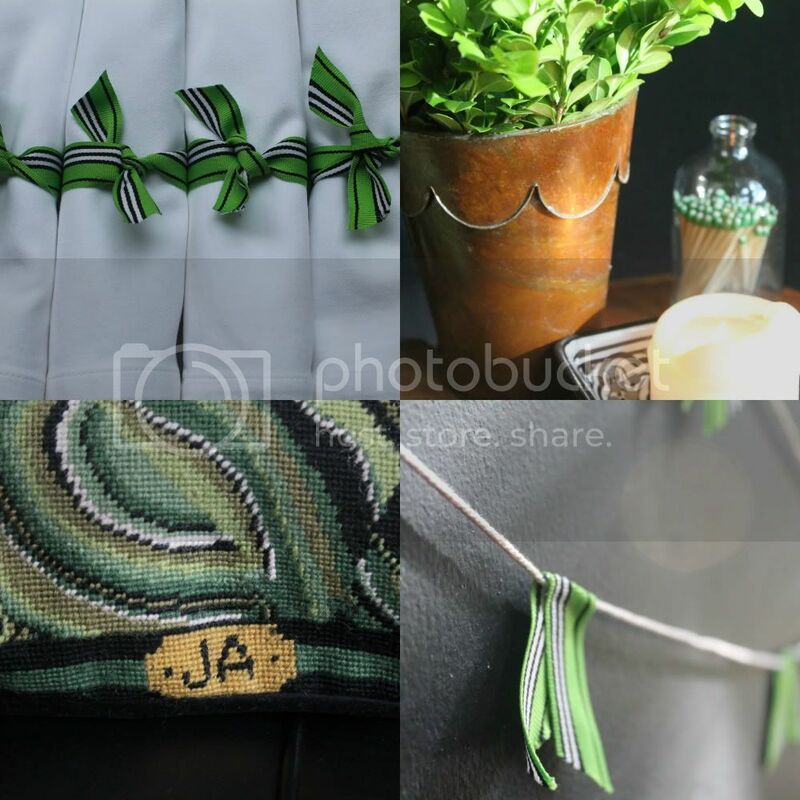 Love the green ribbon and the JA. I have things like that too stashed away, from watching too much Martha Stewart in the 90's, I think. You never know when that table cloth or ribbon or candlestick might be the perfect thing! Lovely things, indeed. i cannot believe you got thos ja pillows for only $5 each. omg, that has to be the deal of the century. and i thought i was good! Gorgeous table for the holiday. The green ribbon is just so pretty and goes so well with the lovely napkins. I agree that Creme Brulee looks fantastic. As alway, I love your photos and your staging. You truly amaze me with your talent. I can't wait to see what you do with your new house! Hop on over today to grab my starfish featured button for your blog...yes you have been featured at NIFTY THRIFTY TUESDAY. Everything looks beautiful! Love all the green! I love your St. Patrick's Day decorations, the touch of ribbon adds so much and the daffodil's are brilliant with Green & White. So much pretty-in-green stuff here! And creme brulee...who cares if it's irish...any reason is a good reason to make it! Hi Annie....I found you!! I decided to jump down to this post to leave a note to you because of all the lovely, refreshing GREEN!!! Absolutely glorious to a desert dweller! Question? Did you take a picture of the lovely table you had waiting for Gary and me at the beach? What a wonderful way to FINALLY meet!